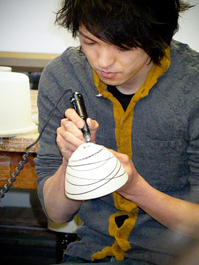 Akio Niisato, 2011-2012 Artist in Residence. The Artist in Residence Program through the Ceramics Program, Office for the Arts at Harvard offers dedicated artists the opportunity to involve themselves in research and growth, pushing their art in new directions in a dynamic, urban studio connected to the Harvard community. Individuals will have the opportunity to build relevant skills in research, professional development, technical ability, creative problem solving, teaching and community involvement through our Artist in Residence Program. To learn about our 2011-2012 Artist in Residence, click here. A completed APPLICATION FORM in hardcopy. Resume in hard copy and saved as a Word document or PDF on disc. Artist statement in hard copy and saved as a Word document or PDF on disc. Personal statement in hard copy and saved as a Word document or PDF on disc. image number_first initial_last name (example: 1_j_smith.jpg, 1a_j_smith.jpg, etc.). Images will be used for promotional purposes upon acceptance to the program. Corresponding image list in hard copy as Word document or PDF on disc. List should address each image by number in terms of: title, year, size of work, medium/techniques used. Two letters of reference from professionals in the field – include: name, title, address, phone number, and email address. July 2nd-6th, 2012 – Finalists will be notified to arrange a phone interview via email with Acting Director, Shawn Panepinto. July 9th, 2012 – Notification will be made via email. July 15, 2012 – Selected artist must accept or decline the residency. All interested individuals are welcome to visit the Ceramics Program prior to application and or acceptance. To arrange a visit and receive more information, contact Shawn Panepinto, Acting Director, at 617.495.8680, or email at panepint@fas.harvard.edu. If you have any further questions about the Artist in Residence Program, please contact Kathy King, Assistant to the Director at kking@fas.harvard.edu.